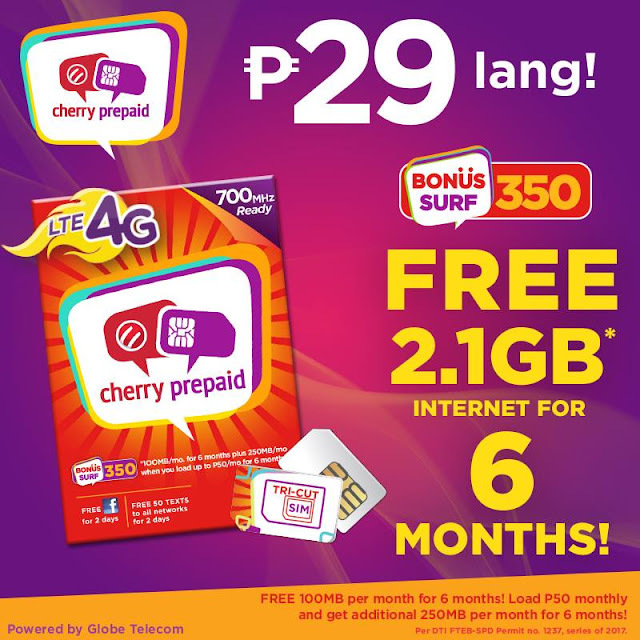 Home / 700mhz / affordable load / affordable mobile data / cherry mobile / Cherry Prepaid SIM / Cherry Prepaid LTE SIM: Load, Rates and other available Promos. Cherry Prepaid LTE SIM: Load, Rates and other available Promos. Cherry re-introduced its own prepaid SIM, The Cherry Prepaid. It was first introduce in the market in 2015, during that time the SIM was bundled on their phone or can be purchase for only P30. Now the newly produce Cherry Prepaid is now even better, its now upgraded to an LTE capable SIM which is perfect for LTE devices specially for those who have 700mHz capable smartphone. Its also pack with bang in buck promos, it comes with different affordable promo to choose from and now has a longer period validity. Note: Free 100MB for 6 months! Load at lease P50 and get additional 250MB per month for 6 months. You may select Promos via *139# or text <Keyword> send to 2138.